Hanging on the wall of the bedroom my twin brother and I shared growing up is a series of eight signed photos and plaques. None has been touched in at least a decade, when we packed up and left for college, and probably far longer. They are arranged in a quasi-pyramid, nestled between a bare closet and some old wooden shelves. The display, such as it is, provides a crude view into the psyche of two baseball fans born in 1984 and raised in Chicago's south suburbs, 20 miles due south of Sox Park. Near the top is Frank Thomas, our boyhood idol, who will—you expect, anyway—be deservedly voted into the Hall of Fame this year, in his first appearance on the ballot. Next to him sits the charismatic Minnie Miñoso, the first black Latino to play in the majors and a man whose omission from Cooperstown calls into question the legitimacy of the entire enterprise. Wilbur Wood found his way up there somehow—a gift from an older relative, I assume. So did Bobby Thigpen, an unremarkable reliever who happened to set a meaningless saves record when Jonathan and I were impressionable five-year-olds. Durable World Series ace Mark Buehrle and shortstop-turned-manager-turned-sound bite generator Ozzie Guillen rest next to Jack McDowell, a lanky lead singer and Cy Young winner. 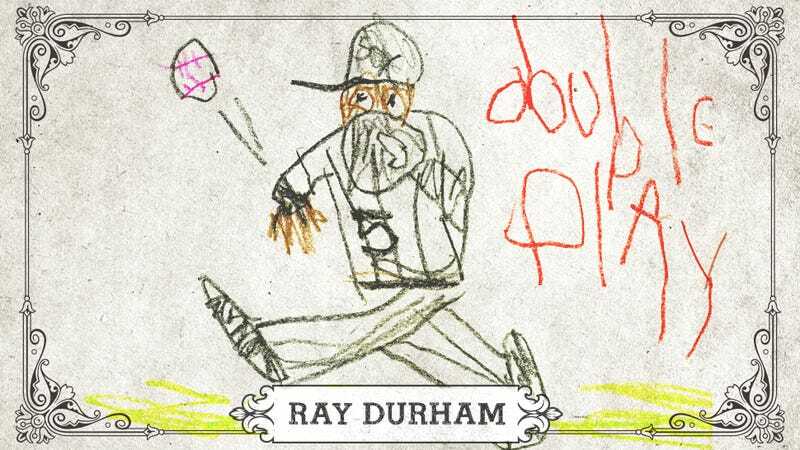 Finally, there's Ray Durham. Before his name turned up on this year's Hall of Fame ballot, I hadn't thought about Durham in a long time. The records say the Charlotte native played in the National League until 2008, a fact I'm sure is true but don't quite believe. When I surveyed a cross-section of devoted White Sox fans, vivid Durham memories were hard to come by. They recalled the aggressive way Comiskey Park public address man Gene Honda used to announce Durham's name as he strolled to the plate, leaning into the vowels of his number (5) and given name. There was the walk-off single against the Cubs in 2000, a 14-inning marathon of a game when the crosstown rivalry still had meaning, before the novelty of interleague play wore off and a World Series title tipped the scales, indefinitely, in one club's favor. A friend's father called to mind a crushing play later that year, in the opener of the 2000 Divisional Series against Seattle, the only playoff series the Pale Hose qualified for while Durham was on the roster; up a run in the sixth with runners on the corners and one out, the stocky second baseman roped a sharp grounder up the middle that Alex Rodriguez snagged on his belly to start an inning-ending double play. (It killed a rally and the Sox's momentum—the Mariners would sweep Chicago in three games.) A few angrily brought up Durham's exit, in 2002, when White Sox general manager Kenny Williams thought he could outsmart Billy Beane and traded his two-time All-Star to Oakland at the deadline—straight up—for Jon Adkins, a chubby, goateed pitcher. Adkins would give up 45 earned runs in 79.2 innings of work over parts of three seasons on the South Side. Durham features prominently in Chapter 12 of Moneyball. Though the memories may be vague, I still feel a fierce affinity for Durham. He represents, more than any other player, the mid- to late-90s White Sox, teams that taught me how to be a patient baseball fan. Durham was called up in 1995, having missed the glory of the early 1990s, when the franchise won a division title in '93 and was cruising to another when the '94 season ended. (Their Pythagorean record before the work stoppage was a half-game behind the Expos for the best in baseball.) He left in 2002, a few years before Chicago finally ended its 87-year World Series drought. In the seasons Durham manned second base, the Sox won 68, 85, 80, 80, 75, 95, 83, and 81 games. They were perfectly mediocre. It's fun to watch a winner. It can be fun, or at least liberating, to watch a team lose miserably, too. It requires more resourcefulness to hang with a team that's never out but never really in, either. The key is finding small moments of inspiration or value where you thought none existed. Baseball—with its quirky rules and pace and length—gives a fan multiple opportunities to do that, 162 times a year. In this anonymity, Durham thrived. At 5'8" with a thick trunk and legs like the defensive back he once was, the switch hitter clubbed for power from the leadoff spot and ran for days. "Look at Ray," Ron Washington tells Michael Lewis, sitting behind the batting practice cage one day in late 2002. "That little sonofabitch got some juice in that body." He'd score from first on a Big Hurt double or launch his own line drive down the right field line and start digging, prompting Harrelson to wail one of his many catch phrases, this one long since retired: I LOOOOOVE watching Ray run! Durham never led his own team in WAR, trailing Albert Belle and then Buehrle in his two All-Star campaigns. (He always was error prone up the middle.) Still, he did what was asked of him, day in and day out, and did it with professionalism and occasional flair. He was a player who made ballgames worth enduring. Does Durham deserve a vote for the Hall of Fame? Probably not. Does he deserve a tip of the cap, and his place on my old bedroom wall? Of course. Adam Doster is a freelance writer based in Chicago. His work about sports and sporting culture has appeared in ESPN the Magazine, The Classical, and the New York Times, among other publications.